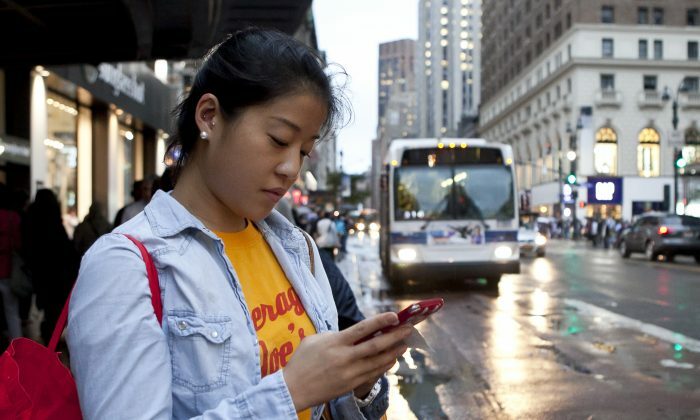 NEW YORK—Waiting for a bus in Manhattan is now much less of a guessing game. The Metropolitan Transportation Authority’s (MTA) Bus Time service expanded to every bus route in Manhattan on Oct. 7. Anyone using a cellphone, smartphone, a tablet, or a computer, can check how far away a bus is from his or her stop. The service was first introduced on Staten Island in January 2012. It was then expanded to the Bronx last November. MTA officials said that the service will cover all five boroughs within six months. According to MTA spokesman Kevin Ortiz, the Global Positioning System (GPS) equipment was installed on buses at nighttime to avoid loss of service. Some 2,800 are now equipped with tracking equipment. “We have found that people are a lot less anxious,” said Tony Alidig lead engineer of MTA Bus Time, in reference to experience with the tracking system on Staten Island and the Bronx. Manhattan is a particularly challenging area for GPS equipment, because tall buildings bounce the signals used to locate buses, according Alidig. A new generation of GPS devices was adopted that can filter out unnecessary signals. MTA Bus Time currently displays the distance of the next bus from the passenger’s stop. Alidig would not elaborate, but said a system that would display time is being discussed. The live data with bus positions is made available for free to mobile application developers. Several Apple and Android mobile applications already make use of this data. IPhone users can try: allSchedules, Bing, Bus New York City, Google Maps, Ride On Time NYC, Roadify, and TransitTimes+. Android users can download Bus Tracker Pro or Sched NYC. The tracking hardware costs approximately $7,000 per bus to install. The MTA expects to spend $7 million over the next six years on maintenance.